Wisdom teeth, also known as third molars, are teeth that usually fully develop during your teenage years. Since they are the last teeth to fully mature and develop they are affectionately called “wisdom” teeth. We get so many questions asked about Wisdom Teeth over at Best Dental. Below are some of the commonly asked questions, and their answers. If you any further questions or concerns in regards to Wisdom Teeth, please feel free to reach out to our office. IV sedation may be required if the wisdom teeth are impacted. If the teeth are impacted, the gum tissue is reflected back to expose the tooth structure. Instruments and drilling methods are used to section the teeth, and remove them piece by piece. After the entire tooth is removed, the area is copiously irrigated with normal saline. The gum tissue is sutured together, commonly with a dis-solvable stitch. How long does it take to heal after wisdom teeth removal? You will be sore and swollen for a few days. We tell our patients that you may look like a chipmunk for a little while. The majority of the healing process takes a few weeks, with complete healing taking around 6-8 weeks. How do wisdom teeth “holes” heal after extraction? Mainly through a process called secondary intention. Bone fills the hole, and soft tissue (gum tissue) wraps around the newly formed bone to completely close up the site where the tooth was taken out. Will I have pain after my wisdom teeth are removed? Yes you will. Pain may last 1-2 weeks after wisdom teeth removal. Pain medication and antibiotics will be prescribed to keep the pain at bay while your body heals itself. Usually the best time to remove your wisdom teeth is during your mid teenage years. The teeth are easier to remove during this time, and the healing process is a lot faster. When do wisdom teeth erupt or come in? This also occurs mainly during your teenage years. Not all wisdom teeth erupt actually. Some wisdom teeth remain embedded in your jawbone. This are knows as impacted wisdom teeth, and they may need to be removed some time in the future. Do ice packs help with the healing process? Yes they do. We recommend placing ice packs on your face for the first 24 hours to minimize swelling. When will my stitches come out? Sutures placed after wisdom teeth removal are dis-solvable most of the times. They usually come out after 7-10 days. Are wisdom teeth also known as third molars? Yes they are. Third molars are another name for wisdom teeth, whether they are erupted or impacted. Are wisdom teeth useless like your appendix? In most cases, wisdom teeth are non-functional, meaning they don’t actively participate in any meaningful action inside the mouth. Some people’s wisdom teeth fully erupts into their mouths, and function just like the rest of their teeth do. At Best Dental, we recommend these patients to keep their wisdom teeth, and make sure they take care of them to prevent any cavity formation in the future. They certainly can be. Some people do not develop them at all. These people, however, are the minority. Most people do develop wisdom teeth at some point in their life. Can wisdom teeth cause ear pain? They can. It is usually the lower third molars that can cause pain to radiate to the ears. In these cases it will be recommend by Dr. Jasmine and her Oral Surgeon to remove your third molars, whether they are erupted or impacted. When do wisdom teeth normally come in or erupt? Sometimes they don’t erupt and stay impacted and embedded in your jawbones. If they do erupt you will usually notice them around the age range of 14-20. 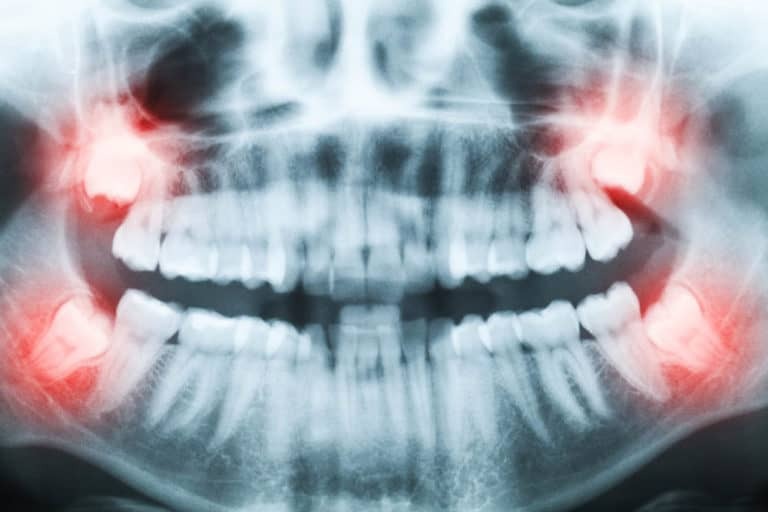 Can wisdom teeth cause vertigo? Usually not. There have been documented cases of potential links between vertigo and wisdom teeth, but this is commonly not the case. If you are suffering from dizzy spells and vertigo please visit your physician immediately. If wisdom teeth is a source of pain and stress, it can certainly lead to a headache as your muscles will be stressed during your time of discomfort. There is no correlation between dormant and healthy wisdom teeth, and headaches. Can wisdom teeth cause a sore throat? Infected lower third molars can certainly cause a sore throat in the infection has spread to the back of the mouth. Wisdom teeth removal will be a priority to remove the source of the problem in these cases. Can wisdom teeth cause TMJ? In the majority of cases, wisdom teeth has no causal relationship with TMJ. TMJ is usually the cause of a joint problem in your lower jawbone. The sensation of jaw clicking normally has nothing to do with your wisdom teeth. Can wisdom teeth cause bad breath? If wisdom teeth decay or form any sort of infection, they can certainly form a foul odor. This is also known as halitosis. Bad breath from wisdom teeth is a common occurrence, so contact us right away if you are noticing a foul odor inside your mouth. If you are in need to get your wisdom teeth removed, look no further than the experts at Best Dental. Contact us today!